This portabella and red pepper wrap is inspired by a wrap that I got at a nearby bar & grill. The only difference is that they use roasted red peppers, plain goat cheese, and garlic mayo. My version doesn’t taste exactly like theirs, I’m assuming due to the garlic mayo, but I decided I could do without it. I’ve made this several times now and it makes for a great lunch at work. 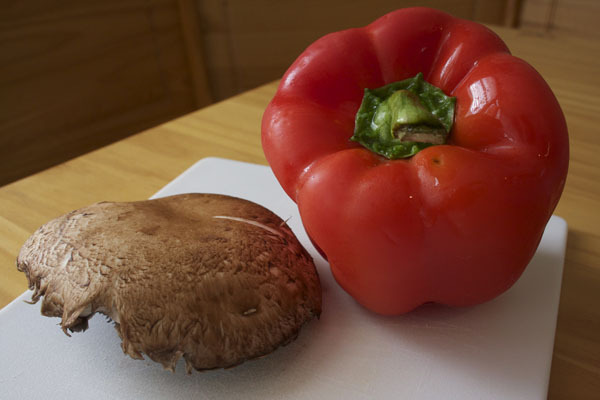 You want to start with a large portabella cap and a small red bell pepper. In my case, this is the opposite, because it’s what I had to work with. And make it work I did. The other star of the show is Trader Joe’s goat cheese with kalamata olives. Has anyone else tried this yet? It’s delicious in all of its salty and creamy goodness. 1. Pour about 3 Tablespoons of balsamic vinegar in a nonstick pan. Add the bell pepper and cook for about 5 minutes over medium heat. I like to cook the bell pepper first because they take longer to cook than the mushrooms. 2. Add the mushrooms, garlic, and about 3 Tablespoons more of balsamic vinegar. Cook for about 10 minutes more, or until the vinegar has cooked out of the pan. 3. Spread as much goat cheese as you like on the wrap, add a handful of spinach, the mushrooms and peppers, and then wrap it up. The key to wrapping without it falling apart is to use the extra large wraps! I think this is my first survey on the blog! This one originated from the Meals and Moves Blog. B is for breakfast today: skipped over breakfast and went straight to lunch. I don’t usually skip breakfast, but I woke up late soooo lunch it was. 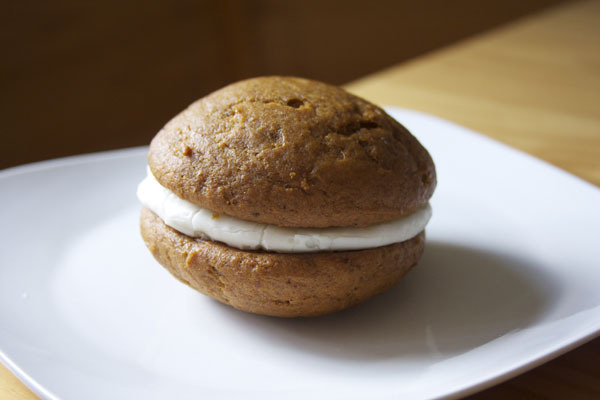 C is for currently craving: Vee’s pumpkin whoopie pie in the fridge that we got from Sunflour Bakery. We split it. I’ve already eaten my half. 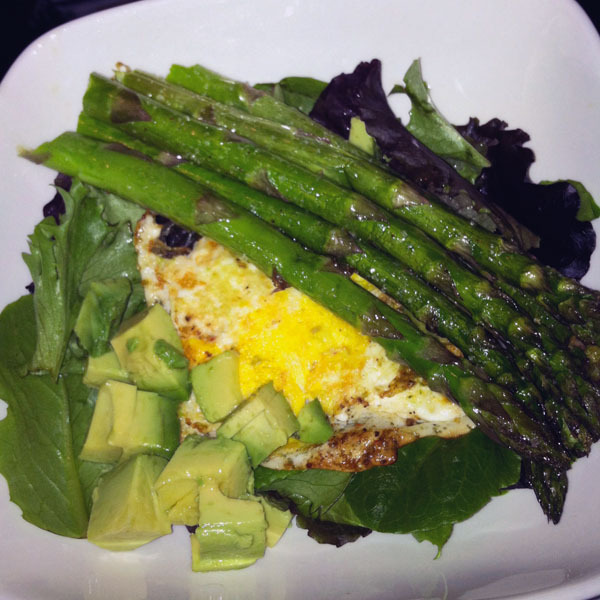 D is for dinner tonight: A Windy Hill Farm egg and greens. 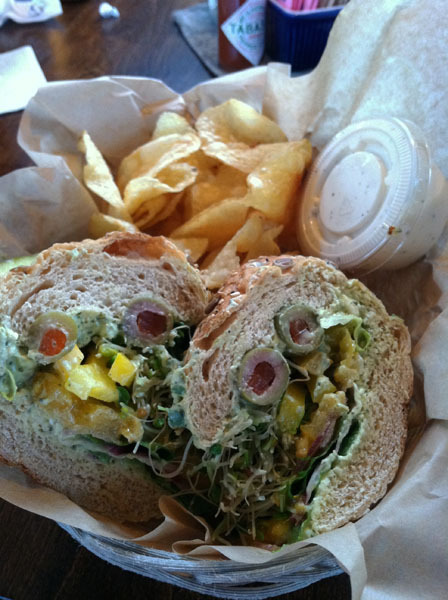 Avocado makes everything better. F is for an irrational fear: ummm I check under the bed to make sure no one is hiding under there before go to bed, haha! G is for gross food: sweet pickles. Bleh. My Mom used to say I was adopted because I’m the only one in the fam that doesn’t like them. I like dill pickles though. M is for the most recent way you spent money: I bought a new flat iron for my hair. I hope it works better than my old one. N is for something you need: A vacation, don’t we all? Q is for a quote: Our background and circumstances may have influenced who we are, but we are responsible for who we become. R is for random fact about you: I really dislike board games, I am however, liking the Draw Something app. T is for favorite treat: You would think that it would be a cupcake, but actually my favorite treat is a brownie or a gooey chocolate chip cookie. I should mention that I changed the U from tell me something Unique about yourself. I know, I’m lame. Here is the original template from the meals and moves blog if you would like to participate too! Earlier this week I attended a conference in Chattanooga, Tennessee for my job. This was very exciting to me for several reasons: I don’t get to travel much for my job, I had never been to Chattanooga, I got to fly! (I haven’t flown in 12 years) and my friend Sandra lives there now. Monday night I was able to hang out with my friend Sandra. She used to live in Charlotte and now she is getting her Masters at the University of Tennessee. I walked a mile from my hotel to meet her at The Yellow Deli for dinner. 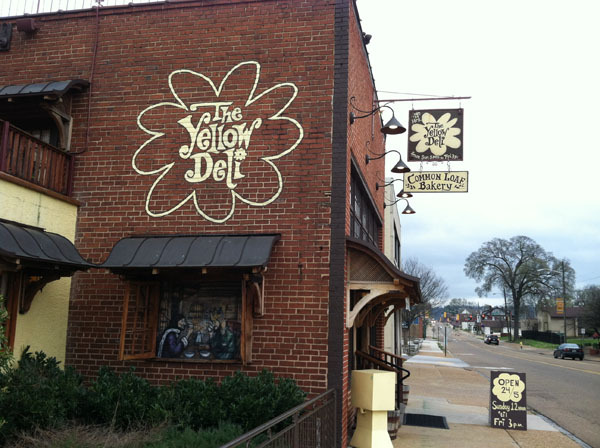 The Yellow Deli opened in the 70’s and they now have a few other restaurants in the states, as well as one in Canada. 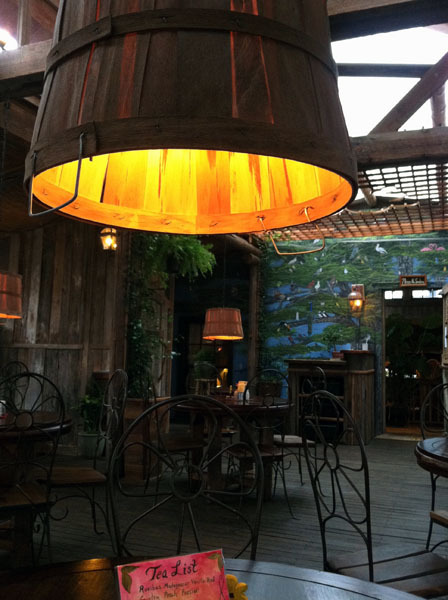 This place is so adorable and the food was really fresh. They serve salads, sandwiches on homemade bread, homemade desserts, a variety of juice, mate, natural sodas, and they even have root beer on tap. Sandra and I both had the Yellow Submarine. The spread of the week was addicting. I’m not sure what it was, but it tasted like hummus blended with pesto. The inside is really cute too. It looks like a big tree house. On the bottom of our ticket, it said “We serve the fruit of the spirit…ask us how.” According to their website, they serve God. Sandra says the rumor is that they are a cult, but everyone keeps coming back because the food is good! 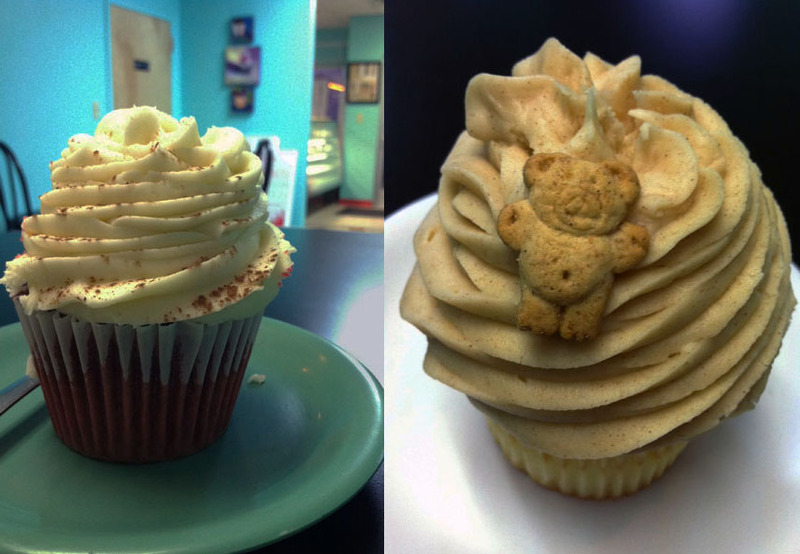 After dinner, we grabbed a cupcake from Chattanooga Cupcakes. 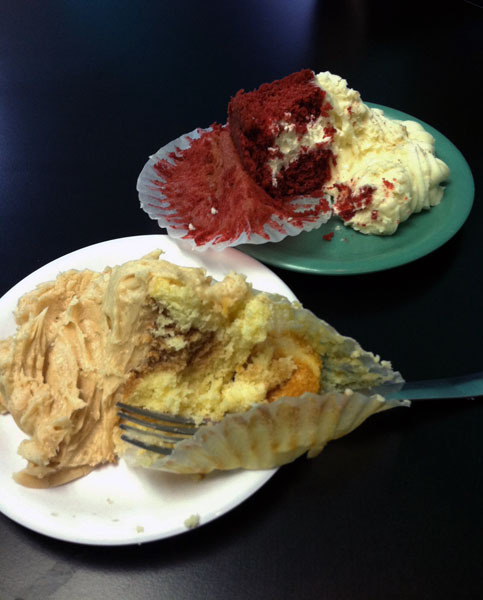 Sandra had the red velvet and I had the cinnamon. Check out the load of icing on these babies!! That was seriously enough icing for four cupcakes at least. The cupcakes were tasty, but needless to say, we did not eat all of the icing. 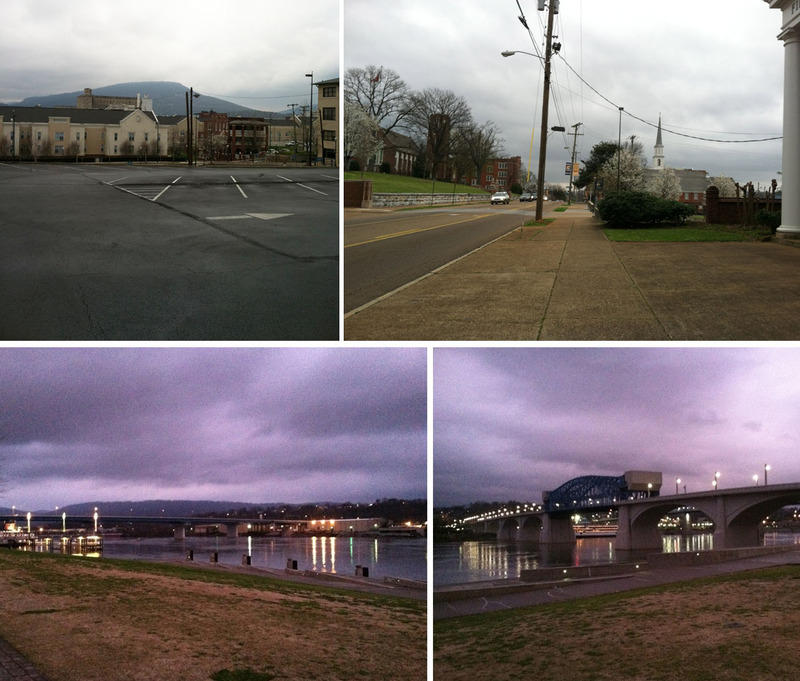 After those sugar bombs, we walked around downtown towards the Tennessee River. 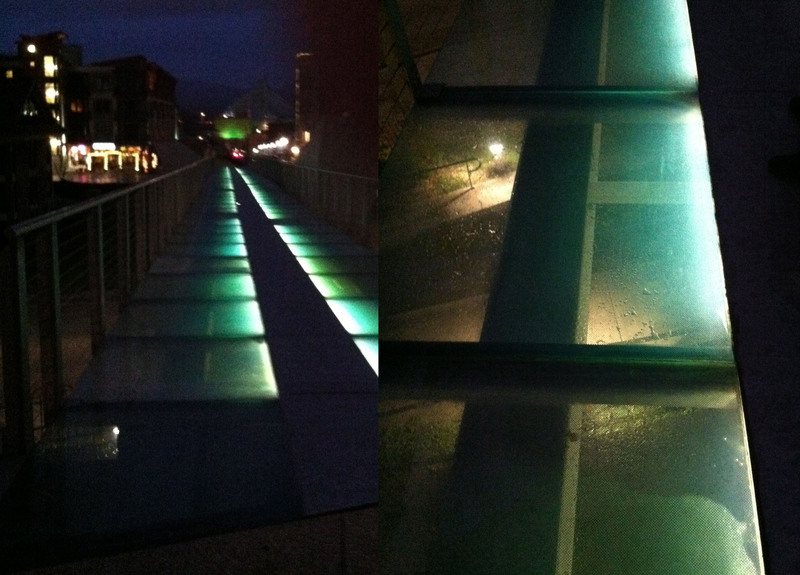 Sandra showed me a glass bridge, which I planned to walk across, but then chickened out. Despite being excited to fly on a plane, I could not do the bridge….I think because the sides were open. I realize that sounds crazy. While walking around downtown, I saw a Moon Pie store and suddenly the random Moon Pie I received in my conference bag earlier made sense. According to moonpie.com, The Moon Pie was born in 1917 by the Chattanooga Bakery. Their goal was to make a filling snack for coal miners. They asked how big and one of the miners held his hand up to the moon and said “about that big”. And so the moon pie was born. Honestly, I’ve never been a big fan of the Moon Pie, but I ate the one in my bag. Are you a Moon Pie fan? P.S. All photos were from my iphone. Valentine’s Day can be overrated, however, it is a great excuse to make something sweet! I firmly believe you should make these for your honey this Valentine’s Day. I’m sure he would love you for it; Vee loves these things. 1. Mix the butter, brown sugar, Baileys, and salt until well blended. 2. Add the egg and mix until well blended. 3. Add the cocoa powder and mix until well blended. 4. Add the flour and mix until just blended. * The batter will be insanely thick! 5. Pour into a greased or lined 8×8 baking dish. Bake at 350 degrees for 30 minutes. These brownies are fudgy, a little chewy, and you are guaranteed to go into a sugar coma. Charlie says to exercise after you eat them, okay? My absolute favorite cookie to get at Earth Fare is the Whole Wheat Chocolate Chip Cookie. I love the sweetness and texture of these cookies. It’s a little crumbly, dense, chewy, and super filling. I decided to take a photo of the ingredients listed and see if I could create a copy cat version at home. Although I do love eggs, these cookies don’t require them. I used agave nectar instead of maple syrup and I used Ghirardelli 60% cacao bittersweet chocolate chips. I think a more appropriate name for them would be whole grain chocolate chip cookies. Mix until all ingredients are well dispersed. Mix until the dry ingredients are all wet. 3. Fold in the chips. * The mixture will not be sticky like regular dough and you will not be able to mold the cookies by hand. 4. Take a 1/3 of a cup measuring cup and fill it with the mixture; pressing and packing the mixture into the cup. Lightly tap the mixture onto a lined baking sheet. 5. Bake at 350 degrees for 10-12 minutes. *The cookies will not rise or spread. I’m really proud with the way these cookies turned out and they taste very similar to Earth Fare’s version. I thought these cookies seemed pretty healthy, but don’t be fooled. I suppose it’s still better than a regular cookie made with butter and white flour. And using agave is better than white sugar since it has a low glycemic index. You could use unsweetened coconut and use 1/4 cup of chocolate chips chopped to make them a little healthier. Although really, the point of this was not to make healthy cookie, but a delicious sweet treat. Mission accomplished. The freezer is a wonderful invention. It makes my weekdays a whole lot easier. I rarely have time to “assemble” my lunch before work, and I would rather not go out to eat because it takes up too much time, money, and calories. I make it easy on myself by taking one day on the weekend or a weeknight to prepare most of my meals for the work-week. I did some major cooking and baking on MLK Day since I had the day off from work! I decided to make winter veggie burritos and used Jenna’s method for slow cooker black beans. Roll all of the ingredients up in a tortilla. During the summer I use zucchini and yellow squash in place of the sweet potatoes and kale. 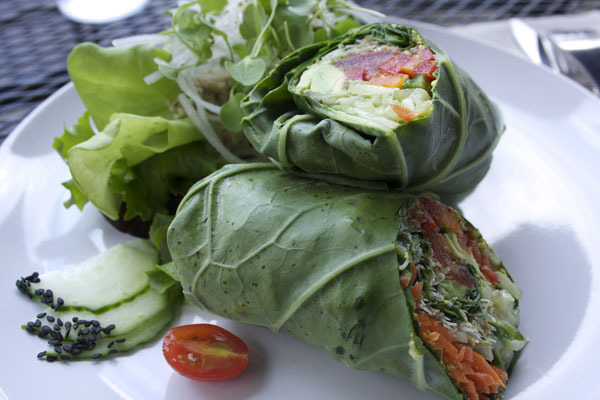 Once you’re done rolling, you can wrap them individually in foil and place them in a bag in the freezer. I ran out of tortillas, so I used brown rice instead. Brown rice freezes nicely; you just cook it, let it cool, and then it’s ready to go in the freezer. You can take them out the night before to thaw, or you can take it out in the morning and put it in an insulated lunch bag. Mine is still frozen 4 hours later, without refrigeration. It usually takes about 3-4 minutes to warm in the microwave. Lunch is not the only thing you can prepare ahead of time. I made blueberry muffins for my breakfast all last week. The recipe comes from The Cupcake Calendar that my sister-in-law gave me (Thanks Ellen!). It’s a neat little daily calendar that has a cupcake/muffin recipe for everyday. I left six out for Vee and I to eat over the next couple of days and wrapped the rest individually in foil and put them in the freezer. Just unwrap and nuke the muffin for 30-45 seconds in the microwave and you’re good to go. Snacks can be frozen too! I made hummus and put it in small freezer safe containers that hold about two servings each. You can put the container in the fridge overnight to thaw. Assuming that you freeze it right away, it will last two days in the fridge. All in the name of time. Amen. Do you any have meal-time saving tips?